Are you looking for an assignment that would better your students' writing abilities? 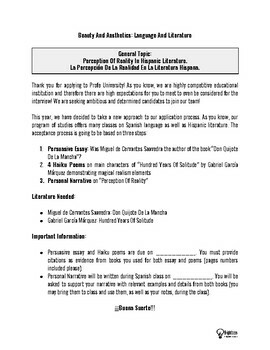 Are you trying to implement Cervantes' "Don Quijote De La Mancha" and Garcia Marquez' "Hundred Years Of Solitude" in your curriculum? Look no further! This unique and authentic assignment is suitable for AP Spanish Language and Culture as well as AP Spanish Literature classes, but can be used in upper levels as well. Students' task is to write a persuasive essay along with haiku style poems and personal narrative, based on the novels mentioned above. Rubrics to all sections are provided. Challenge your students' knowledge and abilities in terms of Perception of Reality in Hispanic World!